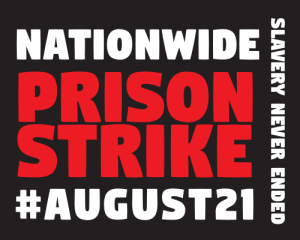 Since August 21st and continuing to September 9th, across the US and Canada, prisoners have been on a general hunger strike. They are fighting for an end to slave labor from corporations and private prisons that drive ongoing mass incarceration of Raza, African, other colonized and oppressed people and poor whites. The right to air their grievances and stand up to the daily human rights abuses they face. This hunger strike which is moving across racial and state lines (with prisoners in Canada joining the struggle), and it exposes the fact that prisons currently exist to make profit and for social control. The 13th Amendment to the U.S. Constitution was written on a foundation of slavery and stolen Mexican and Indigenous land. It states that slavery is illegal in the United States “…except for a crime whereof the party has been duly convicted…” meaning that slavery is legal in the prison system and this is the legal foundation of what we must view as modern slavery within the current borders of the United States. This legal rationale and the conditions that prisoners are forced to live under daily are what is being protested. We need to support this struggle! Everyone in our community – in all oppressed communities for that matter – and anyone who considers themselves a “progressive” and for the people needs to support this! In a country where there are more prisoners and prisons than anywhere else in the world, the motive is not to make “us safe” but to feed the profit-hungry Prison Industry. Prison staff: Prisons are big business, in California and other places, and all states the building of prisons has allowed small towns to become big cities, giving white workers jobs when they could not get a job anywhere else after local factories closed. There is a relationship between business booming and brown/black and poor being locked up. Private Prisons: in all areas, but especially in “immigration” related areas, there is a direct relationship between more people being locked up, convicted of nonviolent crimes, and put in prisons run by corporations who receive more money the more people are locked up. Not only are some companies suing states for not having enough people in the prison beds, but now with Trump locking up and separating whole Raza families and sending children into the foster care system and to concentration camps all over the U.S., we have a motive for companies to build these dungeons and run them, forcing those they have detained to work for companies that have industries. What this amount to is forced labor camps. These are just a few of the ways the Prison System is set up to exploit our community. This brings into question one of the demands, which is the right to vote. The system has made the issue about “crime,” but the fact is that “prisoners” prop up the U.S. economy with slave labor. This is the clearest example of “taxation without representation” where those who sustain the economy can’t influence the policies that keep them locked up and working. Throughout not only California but also the world, it called attention to the inhumane conditions in prisons, and especially the long-term isolation and solitary confinement of prisoners in torture chambers like the Security Housing Units (SHU), as well as the “debrief” program which required prisoners to snitch on others to be moved out of these dungeons. The strike brought together Prisoners of all races and ended the decades long fighting between factions (Norteños and Sureños) – showing what prisoners can do when united against the system. It is clear that the lessons of the strike of 2013 were not lost. Unity and organization are the only way to struggle. Also, we must expose the Prison Industrial Complex for what it is and demand an end to mass incarceration. ¡En las Calles y la Torcida – la Lucha Sigue! This entry was posted in 2018, Analysis, Analysis, Event, Neoliberalism, Police & Migra, Prison Work News & Events, Solidarity. Bookmark the permalink. ← ¡Abolir la Migra Asesina; Abolir los muros de apartheid!